Seed germination is regulated by many signals. We investigated the possible involvement of a heterotrimeric G protein complex in this signal regulation. 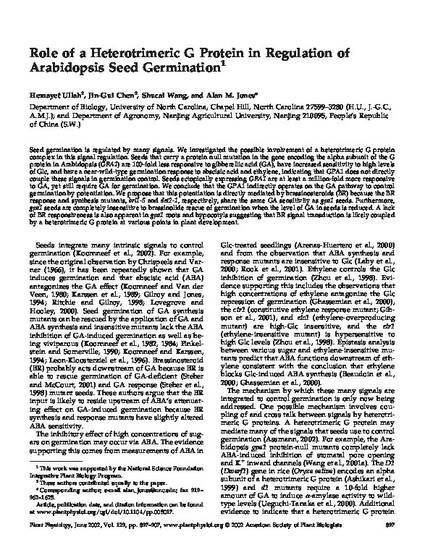 Seeds that carry a protein null mutation in the gene encoding the alpha subunit of the G protein in Arabidopsis (GPA1) are 100-fold less responsive to gibberellic acid (GA), have increased sensitivity to high levels of Glc, and have a near-wild-type germination response to abscisic acid and ethylene, indicating that GPA1 does not directly couple these signals in germination control. Seeds ectopically expressing GPA1 are at least a million-fold more responsive to GA, yet still require GA for germination. We conclude that the GPA1 indirectly operates on the GA pathway to control germination by potentiation. We propose that this potentiation is directly mediated by brassinosteroids (BR) because the BR response and synthesis mutants, bri1-5 and det2-1, respectively, share the same GA sensitivity as gpa1 seeds. Furthermore, gpa1 seeds are completely insensitive to brassinolide rescue of germination when the level of GA in seeds is reduced. A lack of BR responsiveness is also apparent in gpa1 roots and hypocotyls suggesting that BR signal transduction is likely coupled by a heterotrimeric G protein at various points in plant development.